TSPSC IOBs/ Inspector of Boilers Recruitment Results, Certificates Verification Dates 2018: TSPSC Inspector of Boilers Recruitment 2017, Answer key, Results/ TSPSC Inspector of Boilers Recruitment 2017 Hall tickets, Online application form/ TSPSC Inspector of Boilers Recruitment 2017 in Boilers Department: TSPSC Inspector of Boilers Recruitment 2017, TSPSC Boilers Department Inspector of Boilers Recruitment 2017, TSPSC Inspector of Boilers Recruitment 2017 Recruitment online application form, Eligibility criteria, How to apply, Exam date, Hall tickets, Answer key, Results and other details given here. 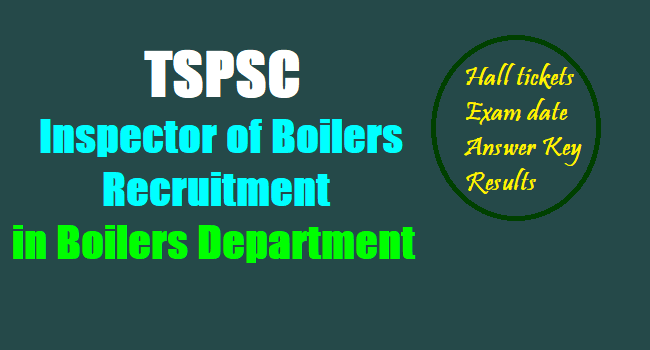 TSPSC has published the Inspector of Boilers Recruitment 2017 in Boilers Department notification on June 1 and applications are invited from qualified candidates through the proforma Application to be made available on Commission’s WEBSITE (www.tspsc.gov.in) to the post of Inspector of Boilers in Boilers Department. NOTIFICATION NO: 33/2017 RESULT NOTIFICATION FOR VERIFICATION OF CERTIFICATES. On the basis of the written examination held on 27-8-2017 & 28-8-2017 to the post of INSPECTOR OF BOILORS in Boilers Department, the candidates with the following Hall ticket Numbers have been provisionally admitted for the verification of certificates. The candidates who are provisionally admitted for the verification of certificates are required to produce the Original certificates along with one set of Photostat copies duly attested by Gazette Officer,, relating to Age, Qualifications, Community (Integrated),Latest Creamy Layer exemption certificate in case of B.Cs as per Memo No.3009/BCW/OP/2009, Government of Telangana, Backward Classes Welfare (OP) Department, Dt:18/12/2015 (prescribed format hosted on website), Certificates relating to claim of age relaxation, , basic information data (Check list (1 set) attestation forms ( 2 sets) and if any, at the time of verification of documents, failing which, they will not be admitted to subsequent process of selection. No request will be entertained for subsequent submission of any of the above certificates. In terms of the notification, the candidate should possess the requisite qualifications as on date of notification i.e., on 2-6-2017. . The verification of certificates will be held in the office of Government Polytechnic College (Sankethika Vidya Bhavan) MasabTank, Hyderabad on 17/01/2018 from 10:00 A.M onwards. such candidate / candidates shall be cancelled at any stage of selection process. Sl.No. Name of the Post No. of Vacancies Age as on01/07/2017 Min. Max. Scale of Pay Rs. 1 Inspector of Boilers in Boilers Department. a) Degree in Mechanical or Production or Power Plant or Metallurgical Engineering from a recognized University OR its equivalent. b)Two years experience as a technical personnel in the design, construction erection, operation testing, repair, maintenance or inspection of boilers or in the implementation of the boilers Act,1923 and rules and regulations framed there under. Application fee: (Remittance of Fee) Each applicant must pay Rs. 200/- (RUPEES TWO HUNDRED ONLY) towards Online Application Processing Fee. Mode of Payment of Fee: The Fee mentioned at Para-I(5)(a) is to be paid online through SBI ePay duly following online instructions once the application form details are submitted by filling TSPSC ID, date of birth and other particulars. The fee once remitted, shall not be refunded or adjusted under any circumstances. Failure to pay the application fee, wherever applicable will entail total rejection of application. The list of Banks providing service for the purpose of online remittance of fee is given in ANNEXURE – II. Hall tickets: Hall Tickets can be downloaded 07 days before commencement of Examination. The Examination is likely to be held on Dt. 27/08/2017 FN & 28/08/2017 F.N. The Commission reserves the right to conduct the Examination either COMPUTER BASED RECRUITMENT TEST (CBRT) or OFFLINE OMR based Examination of objective type.